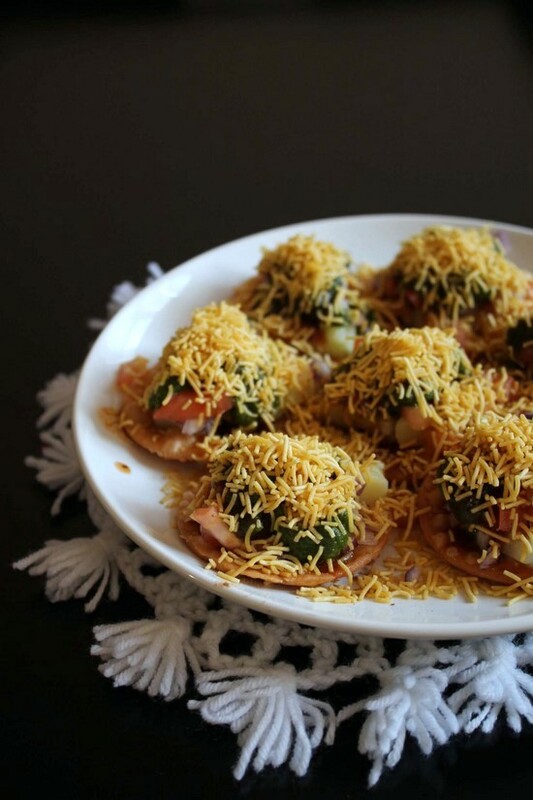 Sev Puri Recipe – a popular Indian street food recipe. This tongue tickling chaat recipe is from Mumbai. Any chaat recipe is my favorite. But this one is my all time favorite. It has all kind of texture and flavors in every bite. You feel crisp papdis, crunchy sev and refreshing vegetables. Also burst of flavors from all chutneys like sweet, spicy, tangy and hot. All these complex yet delicious flavors, You will definitely ask for more. Here in USA, it is hard to get authentic taste of chaat in restaurants. 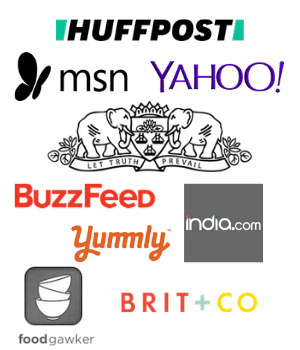 Every time I try chaat recipes here, it is lacking something. Like it is missing enough hot and spicy flavors. Many folks here can’t handle spicy food. Thus they have customized the recipe, so everyone can have it. But it’s my palate, I never liked it. So I always make chaat recipes at home. Papdi or flat puris – Make papdi at home or use the store bought one. It is flat, crispy puris made with all purpose flour. I have shared fried papdi and baked papdi both recipes on the blog. Veggies – It gives refreshing touch. I have used chopped boiled potatoes, onions and tomatoes. If raw mangoes are in season and you have it available. Then use it. It gives nice tangy flavor to the chaat. I have not that handy, so I skipped it. Three chutneys – You can prepared them a day before. Store then in container and refrigerate it. Use next day while making chaat. All the chutneys stays good for a week in fridge. So plan ahead of time to make it easier. Chaat masala – alternately you can use mixture of black salt, roasted cumin powder and black pepper powder. Thin sev – You can make sev at shome or buy it from store. Always use fine variety or nylon sev. It is thin, crispy noodles made from chickpea flour. It is optional, but you can sprinkle some finely chopped cilantro or coriander leaves at the end. 1) We need to make all three chutneys – coriander chutney, tamarind date chutney, garlic chutney. You can plan ahead of time and make those day before and keep in fridge. and use next day while making chaat. 2) If you planning to make papdi and sev at home, then you can make them also few days earlier. Or buy from the store. 3) Right before assembling, keep all the elements on your counter ready. Chop boiled, potatoes, onion and tomato. Also keep all three chutneys, sev and chaat masala on the counter. 4) Now arrange 7-8 papdis on the plate. 5) Put potatoes on the papdis. 7) and then with chopped tomatoes. Also top it with raw mangoes, if using. 9) Drizzle about 1 teaspoon of green chutney on every papdi. Quantity of chutney may vary depending on how spicy your chutney is. 10) Then add 1-2 drops of red garlic chutney. It is hot and strong, so little goes long way. 11) Then drizzle about a teaspoon of meethi tamarind date chutney on each papdi. 12) Finally sprinkle sev on top. 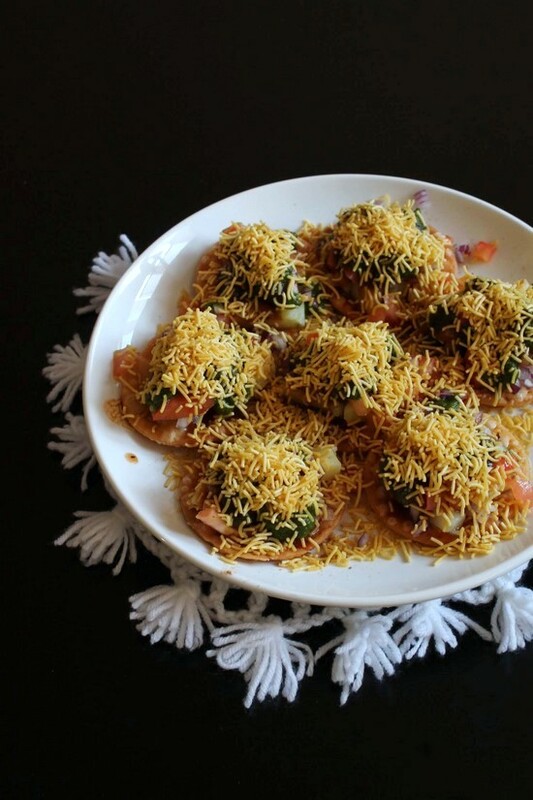 Serve sev puri chaat immediately otherwise papdi will get soft and soggy. Follow the same steps for rest of the plates. Or you can make 2-3 plates simultaneously. Serving suggestion: Serve sev puri as a snack. You can plan ahead of time and make those a day before and keep in fridge. If you planning to make papdi and sev at home, then you can make them also few days earlier. Or buy from the store. keep all the elements on your counter ready. Have boiled, potatoes, onion and tomato. Also keep all three chutneys, sev and chaat masala on the counter. Now arrange 7-8 papdis on the plate. Put potatoes on the papdis. Top it with chopped onions and then with chopped tomatoes. Also top it with raw mangoes, if using. Drizzle about 1 teaspoon of green chutney on every papdi. Then add 1-2 drops of red garlic chutney. It is hot and strong, so little goes long way. Then drizzle about a teaspoon of meethi tamarind date chutney on each papdi. Finally sprinkle sev on top. Follow the same steps for rest of the plates. Or you can make 2-3 plates simultaneously. Nice looks very tempting. we can add some sweet yogurt and chat masala too. Yes yogurt would be good addition. I have kept it authentic mumbai style, so not added yogurt.